Unlock the mysteries of the stars. Click here to play! Can you read the horoscopes to find out if a major fortune is in your future? The Taurus symbol is as good a place to start as any when it comes to reading the stars. This bull symbol is a wild symbol and will replace others (excluding scatters) to bring in more wins. If you can spin two to five of them across a payline, you’ll gain up to 25000 times your line bet. Next, find out what’s in store for the Leos. This line will grab you up to 7500 times your line bet. Aries will get you 2500 times your line bet. Pisces and Capricorn will each get you up to 1000 times your line bet if you spin three or more across an active payline. Cancer, Gemini, Virgo, Libra, Aquarius, and Scorpio will also help you amass your fortune. Don’t forget about Sagittarius! This special star sign is a scatter. If you can spin spin two of this symbol anywhere in on the board and you will win back your bet. 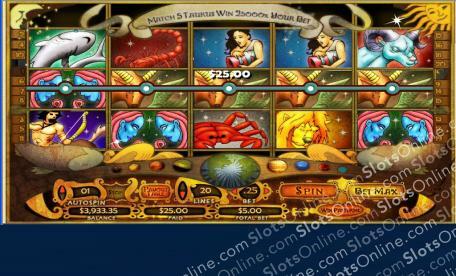 If you can spin three or more you will trigger a bonus game that will see you winning even more cash! So, read the stars in this amazing game to see if you’re in store for a major fortune. The Sagittarius symbol is a scatter. If you spin two of them anywhere on the board you will win your bet back. If you spin three or more anywhere on the board you will trigger a bonus feature. The Taurus is a wild symbol. It will replace all symbols except scatters to help you bring in more wins. It will also payout a massive 25000 times your line bet if you spin five of these symbols across an active payline. Three or more Sagittarius symbols anywhere on the board will trigger a bonus feature. During this feature you will take on the roll of Sagittarius and will have to shoot your bow and arrow at 3 different targets. You will get 4 shots with each one revealing a bonus prize.